Just last month, tens of thousands of students around the world skipped school to protest inaction on climate change. Demonstrations were scheduled in more than 100 countries and territories. Students took to the streets to demand that we all pay attention to the ways that we share responsibility for the earth. In this way many of our students are ahead of us as educators in addressing our impact on the planet. For some young people, even very high-performing students, the future looks so bleak they can’t imagine they will have a career. For some young married couples, climate change is making the decision to have children an ethical conundrum. For others, the fears around climate change are overblown. As we prepare our students for the life ahead of them, we want them to understand what it means to take responsibility for themselves and for the choices they make. We want them to understand the impact of the choices they make on the world around them. Imagine your house, your lovely home. Now imagine pouring fertilizer into your water softener, heaping plastic bottles in the corner, piping your car exhaust in from the garage, and sprinkling mercury onto your dinner before serving it. It sounds absurd. Not only absurd, it sounds wildly reckless. And yet, this is the type of damage we’ve done to the home that supports all life. If it’s overwhelming and scary to imagine that, think of how anxious this might make your students. As a society, we find it so convenient to buy a cup of coffee on the way to work that we don’t take responsibility for the plastic lid that will end up in the ocean. We find it so handy to buy tomatoes in the dead of winter that we don’t take responsibility for the chemicals entering the watershed to grow and ship those tomatoes to us. For our students to grow into responsible adults, they must learn how to find accurate information to inform their decisions, consider multiple points of view, and feel empowered to act. Since many of the students of today are already aware that they will face the consequences of a much degraded earth, let’s help them see their own ability to enact change. Today we are releasing a new set of templates that can be used across subject areas to encourage systems thinking, increase awareness of environmental issues, and build agency. 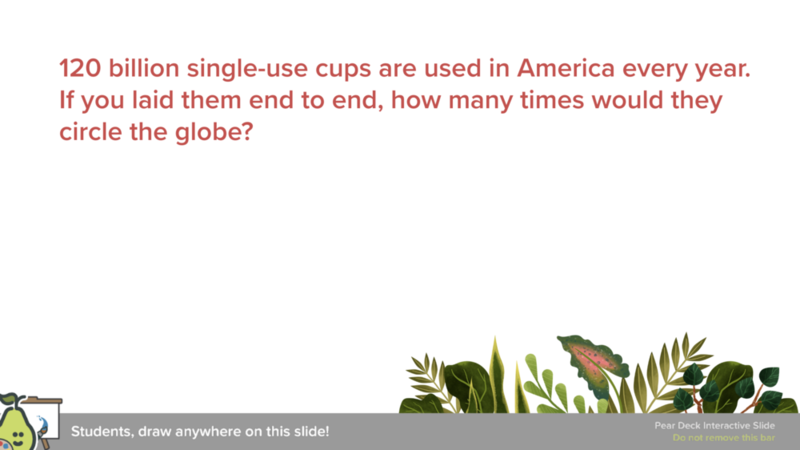 Environmental questions are great to layer into any social studies class. For example, in a history class, when considering past conflicts or how a civilization came to power, natural resources certainly play a part. Get students thinking about which resources powered that civilization, were they overtaxed? Did overtaxing certain resources lead to conflict or collapse? This is a great opportunity for students to learn that the health and availability of natural resources is inextricably linked to our successes and downfalls. Math instruction is about helping students get comfortable with figuring things out. We don’t just want to set up problems for them to solve, we want them to figure out how to approach complex questions from different angles and be able to apply mathematical concepts to them. We can accomplish those goals while also raising awareness of environmental issues. Take this question for example. Students are being faced with a shocking fact and are figuring out how to put the number in context. They will need to consider what facts they know and what they need to know. What’s the circumference of the earth? Are we circling at the equator or some other spot? Would it matter where we circled? All great questions to consider and figure out. There are clearly plenty of ways to incorporate systems thinking and environmental awareness into Life and Physical sciences. One example is to simply ask students to consider how their daily choices impact the world around them. You could narrow the focus of this question to better fit your specific topic. Earth awareness can be layered together with daily social emotional learning as well. Becoming aware of one’s emotions and being able to manage oneself requires understanding the things that bring joy and stress into our lives. Ask students to notice how their mood is impacted by their physical environment. Do they feel differently when they have fresh air and sunlight than when they are in a room with no windows? You will be helping students build an appreciation for their environment while also empowering them to manage their own moods. A common response today is “you do you.” It sounds nice; it’s a way of saying it’s ok to be who you are even if it goes against the grain. Seen another way, or taken too far, our love of individuality is making us blind to the fact that we have responsibilities beyond our own skin. We share a house, a workplace, a street, a city, a country, a planet with other people who have their own needs and wants and preferences. Sometimes we have to learn to share and sacrifice for others. We don’t always get to do what we want for ourselves and that’s okay. Caring for others and sacrificing for others is what binds us together in a mutually beneficial community. As our students learn about the environmental challenges facing their generation, it’s natural that they will experience anxiety. But we don’t want to overwhelm them with anxiety or have them get lost in fear. Instead, we can show them how their content knowledge and skills can be applied to solving hard and real problems. Click here to download the new templates!